The UCLA Department of Neurosurgery offers and participates in a wide array of interdisciplinary educational opportunities for our neurosurgery residents, fellows, medical students, and community physicians. The neurosurgical anatomy lab is run to Warwick Peacock, MD, the former head of pediatric neurosurgery at UCLA and UCSF. Residents dissect the entire human body specimens. 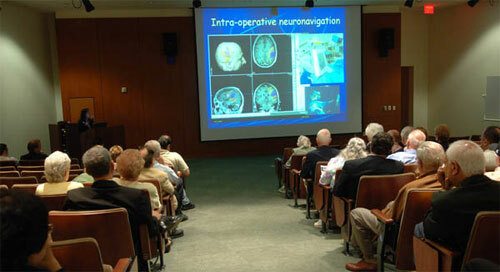 The skull base and neuroanatomy laboratory is run by Dennis Malkasian, MD, PhD., a neurosurgeon. Skull base anatomy and approaches are taught using a hands-on approach on cadaveric heads. An interdisciplinary conference attending by neurosurgery, endocrinology, neuroradiology, head and neck surgery, neuropathology, and radiation oncology.